A deep laser treatment for deep wrinkles, stretch marks, scars, and more. What are skin resurfacing treatments for face and body? Skin resurfacing treatments refer to a set of procedures that remove a set number of layers of the skin. This is done in order to trigger your body’s healing process to create new collagen, elastin, and overall new skin. The new tissue that is created is smoother, is more evenly textured. What type of lasers are used for face and body resurfacing? At Peach Medical Group, we use the Lumenis Acupulse laser to help patients with a variety of moderate to severe skin conditions. This includes deep wrinkles, severe skin texture, acne scars, stretch marks, burn scars, and more. 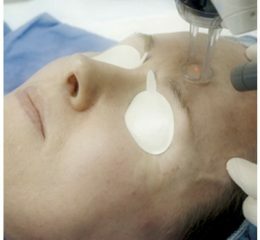 Is this deep laser treatment right for me? This treatment is ideal for patients with the following skin conditions: Deep wrinkles, deep acne scars severe skin texture, stretch marks, and burn scars. Before deciding on this treatments, patient are recommended to become familiarized with the preparation and the down time associated with this procedure. Leading up to the treatments, patients must avoid consuming alcohol, poor diet habits, and make sure to employ an overall active and healthy lifestyle. This will assist in the healing process. This deep laser treatment is about 60 minutes in length. We recommend patients to expect about 7-10 days of downtime. Downtime refers to limiting outside exposure. Your skin will be very sensitive and it is important to protect during this crucial time. It is important to remember that the time after the treatment is just as important as the treatment itself. If the skin is not taken care of, then results may be compromised. For Face: 1-2 treatments are recommended over the span of 12-24 months. The complete repair process, after the initial treatment, may take 4-8 months. After waiting for that time frame, your provider will determine if another treatment is needed. For Body:3-6 treatments are recommended for stretch marks, scars, and burns scars over the span of 18 months.